Product prices and availability are accurate as of 2019-03-03 23:38:00 EST and are subject to change. Any price and availability information displayed on http://www.amazon.com/ at the time of purchase will apply to the purchase of this product. 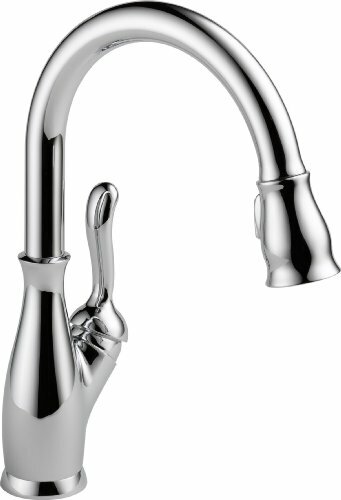 Delta 9178-DST Key Data: Height: 14-7/8" Spout Reach: 9-13/64" Integrated Pull-Down Spray Delta 9178-DST Features: Premier finishing process - finishes will resist corrosion and tarnishing through everyday use Pull-down spray head with dual function spray Single lever handle operation Gooseneck style spout Spout swivels 360 degrees providing greater access to more areas of the sink Includes optional escutcheon (cover plate) - for sinks with 3 faucet holes ADA compliant California low flow compliant - Under 1.8 gallon-per-minute flow rate Extra secure mounting assembly Fully covered under Delta's limited lifetime warranty Delta 9178-DST Technologies / Benefits: Touch Clean: Only Delta offers faucets equipped with Touch Clean soft, rubber nubbins (spray holes) that allow you to easily wipe away calcium and lime build-up with the touch of a finger. This is particularly helpful for areas with hard water. MagnaTite Docking: Delta's patented MagnaTite Docking Technology uses a powerful integrated magnet to securely hold your Delta kitchen faucet's pull-down spray in place when not in use. A light tug releases the wand for total flexibility and a full range of motion. When docking the wand after use, the MagnaTite Docking mechanism will guide the spray securely back into place. 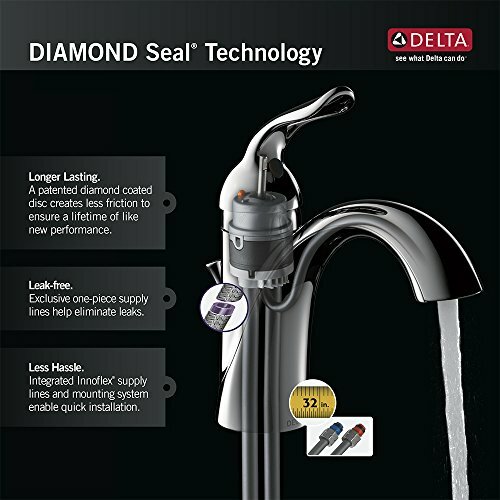 Diamond Seal: Delta DIAMOND Seal Technology utilizes a ceramic disc valve with a real diamond coating to produce a faucet that will last up to 5 million uses. That's an amazing 10 times the industry standard, guaranteeing a lifetime of leak-free, trouble-free performance. Delta 9178-DST Specifications: Height: 14-7/8" (deck to top of faucet) Spout Height: 7-7/8" (deck to spout outlet) Spout Reach: 9-13/64" (faucet base to spout outlet) Flow Rate: 1.8 gallons-per-minute Hole size: 1-3/8" Holes Required: 1 Maximum Deck Thickness: 2-1/2" Escutcheon Width: 10-3/4"